I'm excited to share a new project I've jumped into. 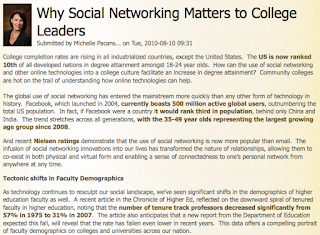 For the last year or so I've been devouring the great resources shared at GETideas.org -- an online community, sponsored by Cisco Systems, for educational leaders to join the dialogue about how and why to leverage technology to transform education. Beginning this week, I will be sharing a monthly post on the GETinsight blog. I'm hoping to create some intriguing conversations relevant to a higher education audience. 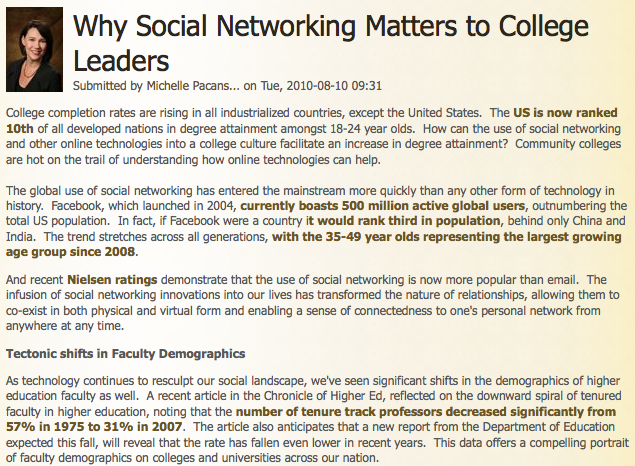 Please join in and share a comment on the post, Why Social Networking Matters to College Leaders. Then, if you'd like to join in on a live conversation with me, attend next week's online Office Hours on Thursday, August 19th Tuesday, August 24th at 9am PST. Details to follow!